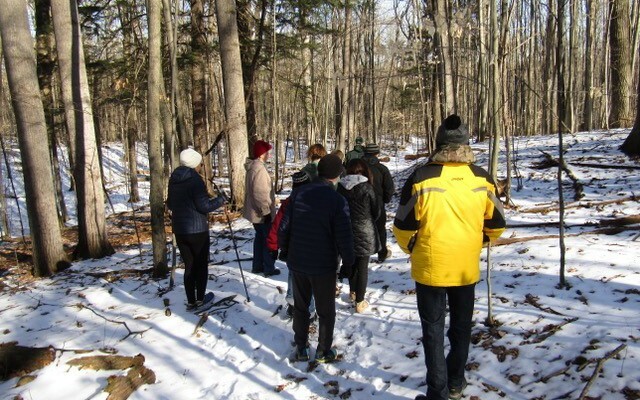 Last Saturday, as part of my goal to visit all 22 of the Chippewa Watershed Conservancy preserves this year, I joined a small group of fellow members to hike in the 40-acre, Audubon Woods Preserve. The early morning weather was clear with a temperature of 21 degrees and a slight northerly wind. Also, since today was St. Patrick’s Day as well as close to the Vernal Equinox, our quest included looking for any green vegetation, both old and new. Parking are cars along Gilmore Rd, we entered the preserve and followed the Water Thrush Trailnorth as it descended a snow- covered slope through a dense forest of tall, leafless deciduous trees. Patches of leaf litter on the path showed that many of them were Oak, Aspen and Maple. The understory included some small Beech trees that still held their dead leaves. Our first sighting of green included mosses and lichens as well as some evergreen trees scattered throughout the woods including: White Pine and Canadian Hemlock. Proceeding north down the slope we paused to observe a few clumps of Woodland Sedge beginning to green out. Nearing the river, we got off the trail and ventured down onto the flood plain to admire the Chippewa River as it flowed fast and full east toward Mt. Pleasant. Meanwhile, a member of the group brushed away some snow to expose green fronds of a Christmas fern. Continuing west along the riverbank, we noticed the green color of a Northern White Cedar on the far shore. Turning south, we followed the Flycatcher Trail up the slope where we spotted several large glacial erratics, large rocks transported by glaciers thousands of years ago. Also, we noticed one of many snags where a Pileated Woodpecker had pecked in search for food. Approaching the south boundary of the preserve, we turned east and followed the trail through hilly glacial terrain where we paused to listen to a Nuthatch and a Sand hill Crane. Finally, after crossing a small vernal stream being fed by meltwater, we continued east back to the trailhead to end the hike.